The play 'HUM DO HAMARE WOH' which will premiere on 27th April has a unique pairing of Anup Soni and Smita Bansal who are a couple in the hit TV Serial Balika Vadhu. The makers have done a casting coup by bringing the hit pair of TV on stage. Smita Bansal says, "I love doing theater. It's a very comical role and after a long time I am playing a comedy character. The scripting is done very nicely. Anup Soni is a very spontaneous actor and the audience will enjoy watching us together." Anup Soni adds, "This is the first commercial play I am doing. The humour is very good and audiences will surely like to see me in the play. The perception of people that I do only serious plays will change after this. Working with Smita is a pleasure." Writer and Producer Sanjay Jha says, "It's a unique play with lot of humour. Anup Soni and Smita are known TV stars and very good actors. People will be surprised to see them doing comedy and that is the novelty. The re-marriage and divorce situation would generate comic situations." The subject throws light on the blind belief which most of the people have in their individual lives on elements which do not have any base or constructive reasons. A couple (Samir and Saloni), who lived almost one and half decade together, suddenly reach a point of a divorce. Samir who is going to die after a few days announces Saloni's re-marriage plans. His drunkard friend (Dheeraj) supports him in his decision and calls for various candidates for Saloni. Unknowingly a friend (Vineet) of Saloni enters the house as a guest and comes to know about the declaration made by Samir. Samir is under a great influence of one famous baba called 'Komal Baba' who has announced Samir's death after 15 days. Samir and Dheeraj both decide to select Vineet, Saloni's friend, to be her life partner for the rest of her life. Saloni doesn't have any grief after hearing her husband's death news! And therefore she starts preparing for her re-marriage with Vineet very happily. Here the black humour starts on stage especially when a salesman called 'Divangat Atma' enters. He is a salesman of nothing but a death celebration and event management company. He tries his best to sell his products and services after hearing Samir's death news till the audience is revealed the fact by way of Komal Baba's entry that Samir is not going to die. In these various confusions and roller coaster what will be Saloni's decision? What will happen to Samir? And what will be the state of mind of Vineet? All such various questions unfold the mystery of the entire story. And to conclude "HUM DO HAMARE WOH" throws a wonderful social message to the audience in a hilarious way. 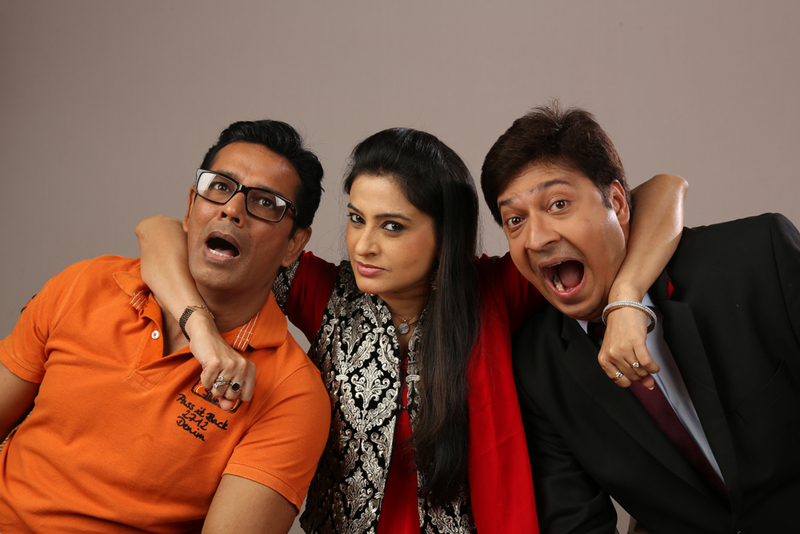 No Comment to " Anup Soni and Smita Bansal's hit pair comes together for a new play - HUM DO HAMARE WOH "